Landscaping, planting, sprinklers, rockscape, pools, ponds"
Make your place look like a million bucks! 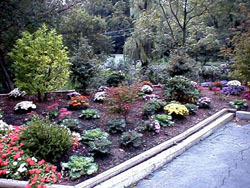 We are your comprehensive landscaping solution, with services including full lawn maintenance, mowing, planting, fertilizing, irrigation and sprinkler systems, rockscapes, pools, and ponds. We'll be happy to use your design, or we'll design it for you. You've got better things to do - take advantage of our cost effective monthly maintenance service contracts. No job too big or too small!